Worse yet, they may be using antiquated phone systems that offer limited features to interface with customers who have higher expectations. In today’s on-demand world, enterprises need to give employees the capacity to communicate more efficiently and more expertly among themselves, and with customers, partners, and prospects. Being ‘out the office’ is no longer a viable reason to miss a call – an expectation that’s driving more Fortune 500 organizations to embrace the concept of unified communications (UC) as a powerful competitive advantage. Modern UC is available in the cloud, but it’s more than just a technology offering ‘as a service.’ With the right UC partner, unified communications ‘as-a-strategy’ fosters a globally collaborative spirit and enables greater productivity, increased agility, and lower costs across the enterprise. Every enterprise has different business needs, despite some common communications requirements (i.e., near-100% reliability or 99.999% uptime). Further, each functional team has unique processes and ways of communicating, requiring organizations to consider all of the various components of the business when unifying communications. An evaluation of the roles and workflows of different departments will determine how a UC platform can best serve different employees. Who are my end users? Do they span across sales, services, support, other? What applications do they use daily? Where do they work – in both the office and field? Is mobility important? Can we support BYOD policies? And do we allow workers from home offices? Are we looking to consolidate vendors to reduce costs? Enterprises do not typically think as broad or deep when it comes to communications features. 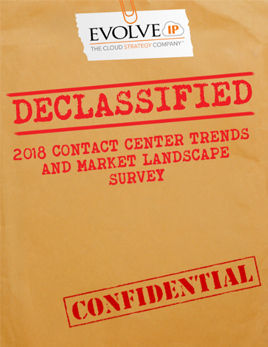 By asking discovery questions to uncover pain points and align functional needs with strategic goals, a cloud communication provider can create a customized solution that serves as the basis of an enterprise UC strategy. Partnering with a UC expert, businesses can understand, plan for, and embrace new communications technologies to meet the needs of users today and tomorrow. 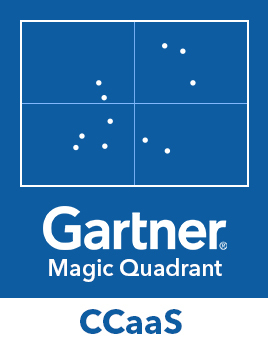 However, it’s important to note that – like enterprises – not all providers are the same. Most vendors simply drop their generic product ‘one-size-fits-all box’ off at the door without ever having worked with executives to tailor a solution that reflects enterprise-wide business goals. However, Evolve IP is different. They work closely with enterprises, understand their business needs and create a customized, easy to use solution that meets the organization requirements. After thoroughly reviewing a client’s current environment, architecture and needs, Evolve IP in contrast, delivers communication tools and applications where the enterprise works today such as Microsoft Outlook, Google Apps, and Salesforce. It also delivers them across the desktop, tablet, and mobile operating systems for easier adoption by users. 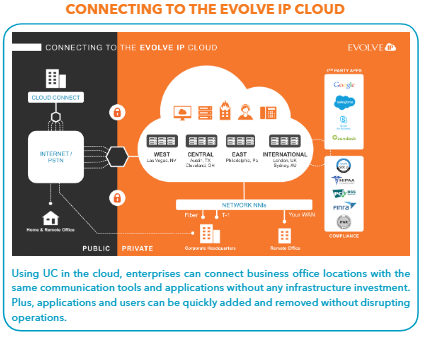 Evolve IP UC experts can configure the right features that the enterprise needs so users can work more productively leveraging preferred, familiar methods user interfaces. For example, most sales teams use a sales automation system to manage their operations. Rather than requiring sales to input client updates back at the office, it’s easier to make that capability available on other devices. Similarly, a support team that uses a CRM system would benefit from instantly viewing open cases when receiving calls from a particular customer. Determining how to bridge critical applications used by different departments into a communications solution is part of the UC strategy. While different UC vendors have similar products and features, the solution must be tailored to company operations. Applications out of the box will only get companies into the ‘red zone’; it’s the customization that takes them over the goal line. In addition to design, expert UC providers can efficiently manage technology implementation, service additions, upgrades, and ongoing support. Larger enterprises, in particular, can benefit from experienced teams to help with their transition to UC. For example, Evolve IP will help install the new UC solution with the least disruption to the working environment and current IT infrastructure while providing a seamless transition to the user base. Training, too, is imperative before going live. While employees may have the applications necessary to work more productive, they need to know about the different features and how to utilize them to get the full benefit from UC solution. Lack of proper training can be the biggest hindrance to getting a full return on the UC investment. In 2015, 37 percent of employees in a Gallup poll said they worked remotely at one point in their careers, compared to 30 percent in 2006 and just 9 percent in 1995. As an increasing number of workers telecommute on some basis, employees must have the capacity to complete projects and tasks from virtually anywhere. By providing remote workers with access to the same communications services as office based employees, enterprises can maintain consistent levels of productivity, collaboration, and efficiency across the organization. 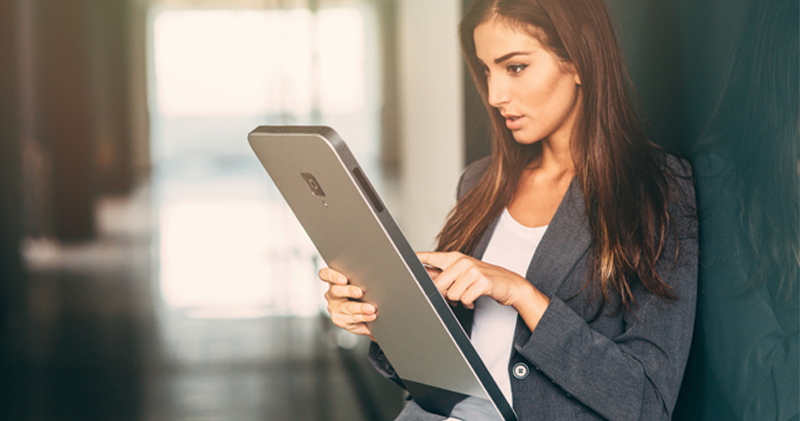 Connecting all business communication tools and applications onto one platform, UC supports consistency among different devices to give employees the same user experience on their mobile devices as on their office computer or phone set. Essentially, workers can conduct business from their smartphones while on the road, using business extensions to access all the features offered through UC. This benefits everyone – the employee, the customer, and the business. In fact, Inc. Magazine reported that 67% of organizations increased mobile worker productivity by implementing unified communications. Similarly, Bring Your Own Device to work is a growing trend, especially among millennials. 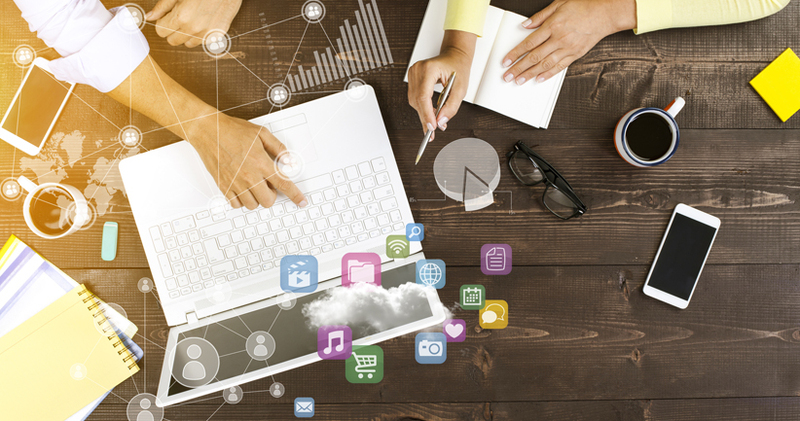 Younger generations expect more flexibility to work from the location of their choice but using the same modern technology from their personal lives to communicate, including social networking, instant messaging, video on demand, and more. Satisfying these expectations is core to avoiding frustration and disengagement among workers. By 2018, Gartner predicts that employee owned devices will double enterprise owned devices at work. Companies, therefore, must take heed of how employees use their personal devices in the business setting. 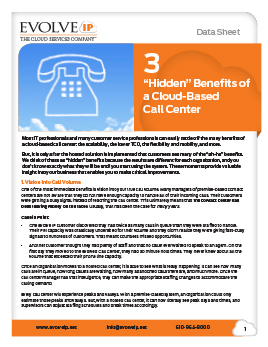 Rather than let employees use a myriad of their own applications to communicate with staff and customers, companies can use cloud UC to duplicate the same capabilities available on the office phone on an employee’s personal device. Empowering the user with the proper tools to work efficiently is the ultimate goal, but it also makes the enterprise more attractive to new entrants to the workforce. All of this reflects the new reality: an untethered workforce enhances revenue opportunities while improving employee morale. 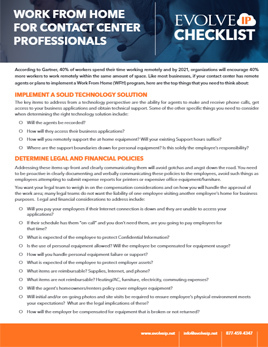 However, enterprises need to determine whether their IT staff is equipped to support a range of personal devices. By integrating real-time business communications tools together in one user experience, UC supports the BYOD environment, optimizes work processes, enhances collaboration among workers and customers while reducing operating expenses and obstacles for employees. Having all the right business communication tools is the first step but not enough. In addition, business applications need to be integrated for a comprehensive UC solution. Most enterprises leverage a range of business applications from different providers, forcing employees to use separate access protocols to log into each application – and this wastes time. It also means that any relevant interactions happening in one application or system aren’t easily made visible or accessible in other applications, hindering users’ ability to accurately collaborate with customers and team members. UC, on the other hand, brings these diverse applications together and only requires one login to access all available features and functionality. This consistency enables workers to quickly shift between tasks and applications to communicate faster with customers, partners, and each other. No longer will employees need to toggle between applications, log in and out of different applications, or generate a new link to share their screens. With UC, they can video conference, send group emails, and place calls within the same software platform and all of the interactions are captured to improve both visibility and reporting. In another example, customer relationship management (CRM) software should be integrated onto the UC platform to provide users with immediate access to customer information from any device. Using the cutting edge tools offered by UC, users can better collaborate with other workers and customers in different communication formats. Instead of playing phone tag or sending emails that sit in a box for hours, distributed workforces can communicate in real time using a variety of modern communications channels. With UC, it’s even possible to receive a message via one medium and respond through another. This capability leads to faster response times and improved productivity. Additionally, employees and customers can quickly share documents and have a more personal exchange of information by being able to use a number of different UC features concurrently. For example, if two offices across town are working on a project quote, employees at remote locations can review the contract in real time together by using video and desktop sharing. The proposal can be finalized within minutes instead of spending hours sharing documents back and forth. Employees can share files with co-workers and customers from virtually any location – stored in the cloud, volumes of data are also available for analysis. An added benefit is savings on long distance phone costs between the offices. In addition to this, enterprises have increasingly started looking for team based project management tools such as Slack, Asana, Team One (formally Intellinote), Wrike, Hip Chat. 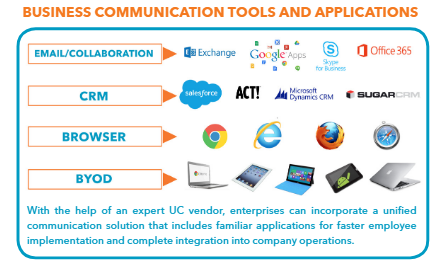 These supporting UC tools allow enterprises to further improve business efficiency, productivity, and collaboration irrespective of where the employees are working. Using UC features concurrently, users can create multi-channel sessions to enhance the customer experience. Should an employee be in a meeting with a prospect and need managerial input, the availability of the manager can be checked in presence then connected through a company extension that forwards the call to his location, whether at the office desk or on a cell phone in the field. 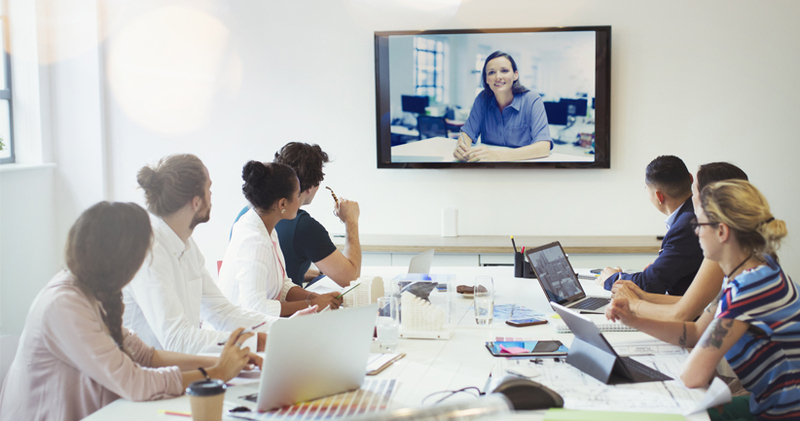 Video conferencing can make the interaction a more personalized experience. To add another person to the call, the manager can send an instant message to check on their availability and, upon confirmation, add them to the group discussion. With customer relationship management applications integrated into the UC platform, users can search for contact information and content from any device instead of waiting to return to the office. 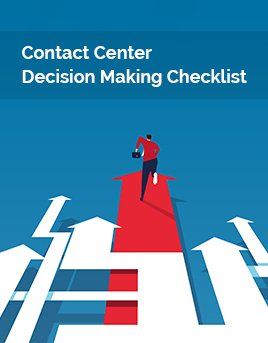 In a call center where seconds sometimes make the difference between a happy and lost a customer, UC can support quick interactions by directing calls to another location if a staff member is unavailable. A cloud UC also streamlines workflows, so employees can quickly access client information instead of rooting through different windows. UC saves time, especially considering the number of wasted minutes searching for information. Quick responses also make for happier customers. An increasing percentage of businesses are transferring their UC systems, email, documents and business applications to the cloud. According to a 2015 Unified Communications & Collaboration study conducted among audiences of six IDG enterprise magazines such as CIO and Computerworld, enterprises will lead this movement. Just like smaller organizations, big businesses don’t want to manage servers, complicated licensing, and annual agreement costs. 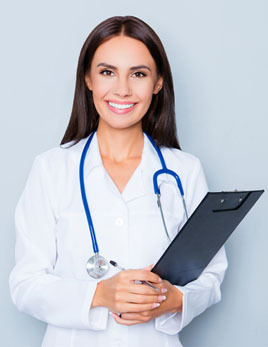 They understand the value of paying an annual fee for specialized, contract services. When UC operates in the cloud, the day to day maintenance and management of the infrastructure and the associated systems are no longer the sole responsibility of the internal IT department. 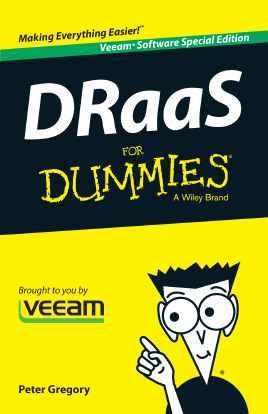 Companies no longer need redundant hardware and processes. They don’t have to worry about the large amounts of data and cost of renting data centers as high levels of reliability and availability are delivered under a service level agreement. By moving on-premise communication infrastructures to the cloud, companies can redirect the captured time and budgets to drive relationship management with outside suppliers, customer-facing innovation, and other such projects that funnel revenue into their businesses. Another and less understood benefit to moving to the cloud is the rapid pace of innovation cycles. In the cloud, UC technology is automatically updated with the latest and greatest new application features – at no cost. Cloud UC providers like Evolve IP transparently push out free updates regularly (typically every 90 days) so there is no disruption to users but all benefit from new functionality. Further, enterprises can quickly deploy new communications capabilities without investing in new software. Because UC is continually evolving, enterprises can be the first to take advantage of new or emerging applications simply by deploying them from the cloud. At the same time, companies save money by replacing unneeded or outdated applications with higher performers. And, IT is freed from the burden of implementing upgrades and system enhancements. Cloud solutions are also uniquely scalable – a crucial advantage to rapidly growing enterprises planning to recruit new staffers, open branches, or grow market share as they can add new users quickly and easily. Also, in many cases, new employees can share existing resources through a cloud-based UC platform. For example, a call center can utilize one phone among multiple staff members with varying shifts. When one worker logs out, another employee logs into the same phone with his profile settings to use it as his own. Companies can add new shifts of workers without adding new dedicated phone sets for everyone. In addition to reducing costs, shared resources reduce office space requirements. The cloud offers a secure solution that is virtually always available and providing enough bandwidth and security that data transit never becomes a problem. Built-in disaster recovery and business continuity features mean that business communications keep running regardless of what happens at a company’s physical location. During an unfortunate event of continuity issue, your hosted service provider should be uniquely capable to help your enterprise get up and running again, quickly. It is essential to ensure that your communications and computing are available regardless of onsite conditions, that you can recover key data and services in just minutes, and that your network has multiple points of entry to our cloud. One of the most common business continuity issues is network connectivity failure. Using software-defined networking (SDN), UC providers such as Evolve IP can eliminate the continuity concerns by combining the bandwidth of multiple public connections (from nearly any carrier) into a single, faster, more reliable virtual connection that can be used to securely access the Internet and replace expensive WAN connections. Also, many enterprises do not have any plan for the continued operation of their voice services in the event of a disaster. 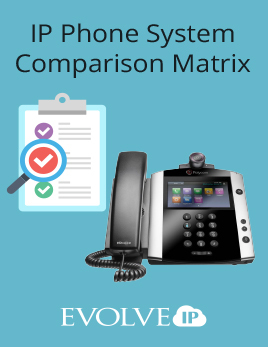 Since most phone systems reside at the customer location, an onsite disaster or simple outage effectively disconnects that location from the rest of the world. Customers and vendors calling that location are met unceremoniously with a “fast busy” signal. Customers in the cloud, however, can continue with a business ‘almost’ as usual. If a location is unavailable for a period of time, employees can simply take their work at home or use a unified communication & collaboration tool to remain productive and available without your customers knowing they’re “homesourcing”. Mobility is a must, and possible with the cloud. International Data Corporation predicts the mobile workforce will grow from 96.2 million in 2015 to 105.4 million in 2020. Cloud-based UC supports mobility that allows remote and mobile users to access data, voice, video and phone service on any device, anywhere. That means employees can leverage critical communications capabilities and applications to conduct business and retrieve messages and valuable content while traveling, involved in a remote business meeting, or just on the go. In turn, customers can quickly reach busy workers through a business number that rings on an employee’s mobile device. A cloud UC platform provides seamless mobility that keeps the workforce engaged with the office, employees, and customers in any location for ongoing productivity. Enterprises are shifting from communications as just a means to an end to thinking of it strategically – and that’s the crucial first step. Next, the technology that underpins the UC solution must be cloud-based – the cloud is proven to offer greater flexibility, scalability, and cost efficiency than any other technology on the market. The final piece of the enterprise UC puzzle is customization. With the right UC vendor serving as a partner, enterprises can get the most from their investment because partners take the time to tailor the UC solution to meet each business’s unique needs. Evolve IP provides its customers with a fully customized solution to increase business efficiency, productivity, and ROI. Evolve IP works with each customer to understand their business processes and communications challenges, and then creates a unique solution that addresses these individual needs. No other UC provider provides this level of tailored support. Below is just one example. With many full-time employees disbursed in home-based offices away from its Delaware headquarters, an outdated phone system hampered communications among workers at International Literacy Association (ILA), creating a number of operational, financial and technical challenges. Traveling and remote workers used their personal phones to conduct business, creating a logistical headache and money pit when it came time to audit and pay for monthly bills from precious funding. In addition, the phone system would frequently fail, requiring costly service calls to get back online. Even as the phone system neared the end of life, ILA paid software upgrades just to keep it running. Upgrading the entire system required a significant investment in new hardware that included everything from servers, phones, and software. 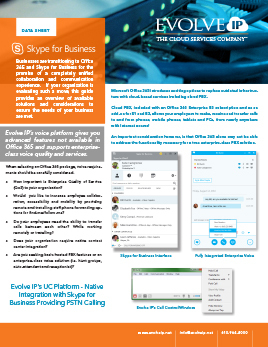 Moving to Evolve IP’s cloud-based UC-One solution gave the organization the redundancy and opportunity to move from on-premise hardware. Offsite workers can now use a single phone number, regardless of calling location, which appears as an office number when conducting business. In addition, every phone number reflects a Delaware locale, which protects the privacy of the employee while reinforcing corporate branding. ILA no longer needs to provide mobile phones to every employee, which derives savings of more than $75,000 annually. (Calculated as $100 per month for mobile service for 65 employees, multiplied by 12 months.) UC-One also puts employees in control of their own communications management via a desktop or mobile application. As explained b ILA Networks Operations Specialist Nick Giotti, “All team members are now able to easily manage their own call handling capabilities such as follow-me features – anytime, anywhere, without requiring a moment of IT support.” Nick Giotti also noted UC-One’s ability to integrate with Microsoft Office 360.back online. Big data is one of the concerns that keep enterprise executives up at night. There is so much potential and competitors are racing to figure out how to leverage it all to ensure a competitive advantage. Executives believe it is the key to future success, but data’s potential value is wasted if enterprises can’t easily extract, interpret, and utilize it for decision-making. A smart UC strategy can pave the path to take advantage of the data you already have and what you could eventually capture. 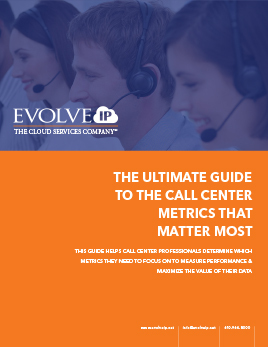 In a small example, UC can enable rich analysis of call center data so managers can identify peak call volume times and staff agents accordingly (and more efficiently). While call analytics is certainly not new, the availability and ease of access to data optimize the process for companies. A UC infrastructure enables the real time or near real time capture and analysis of crucial data that businesses can immediately use to improve processes ‘in the moment’ and enhance their decision-making on-the-fly. This at the moment data capture will play an increasingly important role in business-critical decisions going forward.